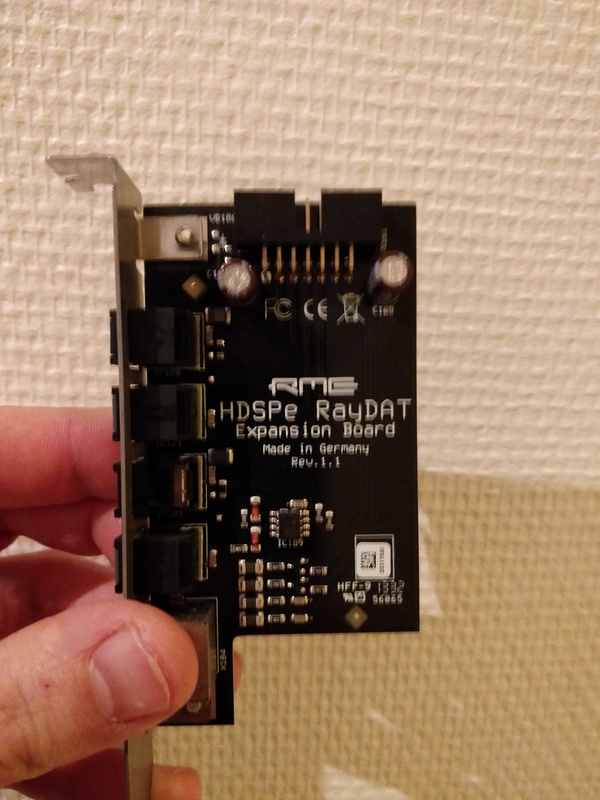 HDSPe RayDAT, Soundcard PCIe from RME Audio in the HDSPe series. Procman's review (This content has been automatically translated from French)" Excellent map"
No analog / digital this. So no opinion on the quality of the converters. The key is that this card when inserted dan PCIe port the computer is forgotten. Never a crash, never a bug, drivers are made regularly by RME days. A routing (Cubase 5-7) perfect (Any input goes to any output). 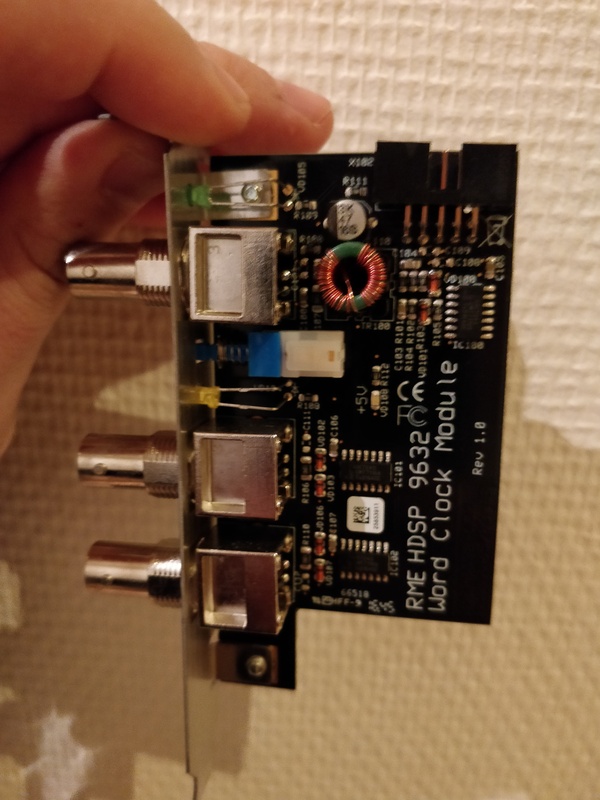 linn134's review (This content has been automatically translated from French)" A digital panzer"
- The RAYDAT is a dual PCI Express card, master card with PCI Express slots (very small) "standard" and not "low-profile" or as "short", with optical inputs and outputs, a connector for flourished SPDIF / AES and internal pin for daughter card. 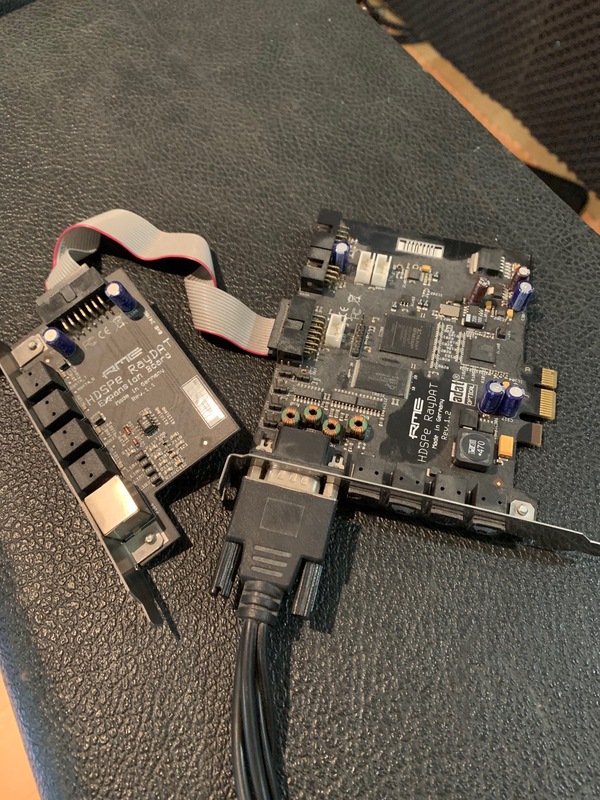 The secondary card is the same size, but with no PCI Express connector pin for dialogue with the main card interface, four optical and taken to the MIDI breakout cable connectors. - The PCI Express interface is terrible for the continuous transfer of wholesale broadband, with a reliability (light years FireWire and USB1 / 2/3). - An expanded and complex interface also allows you to view what's in and what comes out of all of the channels on the map, in real time, with assignments and earnings. A real virtual console in the card itself. - 32 ADAT channels is a lot and does not serve everyone, which is why the RAYDAT is expensive and has special functions: it is the professional equipment to a pro rate. We must remember that this beautiful map (yes, beautiful and well done) is reliable and high quality, but it is demanding. Indeed, the simultaneous recording of 32 tracks demand a coherent machine with materials that collect 32 channels, so we can exclude too slow hard drives and look to the new SSD much faster. Core2 Quad processor, 4 GB of RAM (soon to be 8), two SSDs (one for the system and for the "rec"), two hard drives faster a terabyte each for archiving, a silent passive graphics card dual screen, a large modular power supply and that's about it. The motherboard is a micro ATX in a Lian Li case (see on my profile) and all this makes us a cube 30x30x40 cm completely silent. Reaper is used to capture and mixing occurs Mixbus being finalized, all under Windows 7 Pro. 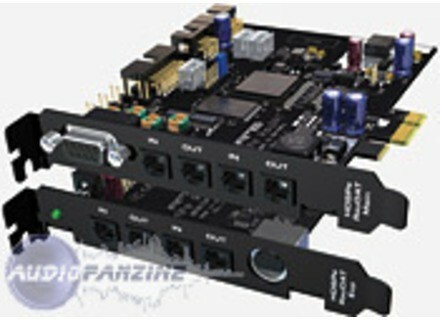 The RAYDAT is interfaced with a digital Yamaha 02R v2 with 4 ADAT cards. Roule ma poule, the card is perfect even if the "mixer" RME is sometimes a little twisted when you already have a console upstream. One of the few cards that can handle four ADAT input and four ADAT output, the HDSP 9652 is more upscale with ADAT I / O bonus. When we do not like the service Motu (especially on PC) the RAYDAT is an excellent tool. The ADAT and AES are digital protocols that carry both audio (8 channels ADAT, AES 2) at the same time as the reference clock. The ADAT and AES do not need another clock (such as Word Clock BNC) to operate. The RAYDAT has no output or analog input, it is 100% digital and contains no AD or DA converter. In this sense it is impossible to talk about "sound quality" since the signal is digitized before it necessarily. The sound quality through the RAYDAT will be that of your AD and DA converters. ANANDEVA's review (This content has been automatically translated from French)" Reliability, stability, speed"
Price with with Word Clock option. Uses three slots of the computer suddenly! Very good PCIe card, easy to install Hyper. 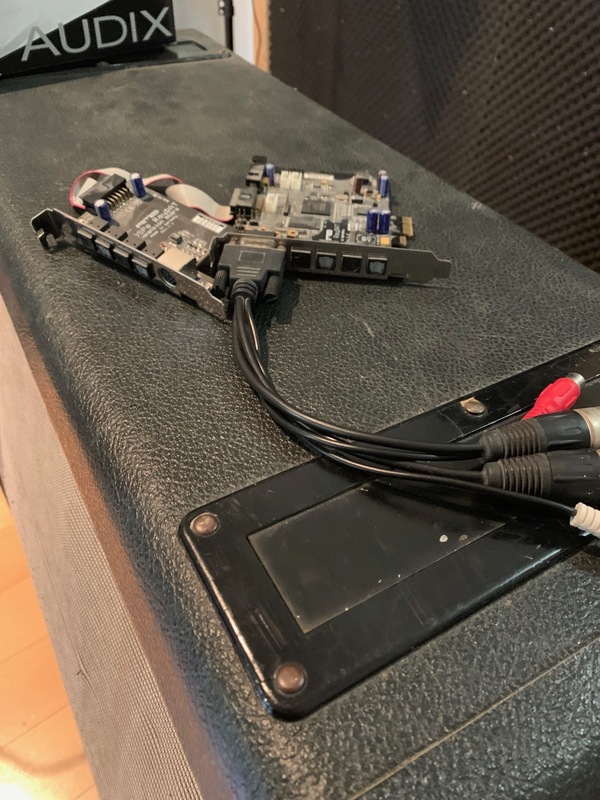 I've never had problems with one for 3 years and yet all connectors are plugged 32 ADAT channels used + AES / EBU + S / PDIF + MIDI ... 128samples dormant on a PC Core2Duo 3.16 GhZ! all without force. Warning qd Cable selection if you do not use the original ones. There is no space between the bcp connectors (ADAT). - No screen indicating the IN and OUT numbers. Ok, there's no place but a little color code would have been welcome. - An IN / OUT duo analog + on flourished would have been perfect, just in case.